Sports are fun, but they can also expose players to eye injuries, some of which result in impaired eye vision or even irreversible blindness. According to the American Academy of Ophthalmology, each year sees over 40,000 cases of sports-related eye injuries! Although the statistics seem grim, there is hope. Prevent Blindness America, a leading volunteer eye health and safety organization, reports that 90% of all reported eye injuries in sports can be prevented if you take the necessary precautions and use protective eyewear. Which Sports Can Cause Eye Injury? Low risk sports involve zero bodily contact and no flying or swinging tools (like balls, pucks, bats, and rackets). E.g. car racing, track/field running, cycling, gymnastics, and swimming. High-risk sports (or collision sports), involve flying objects and a significant amount of body contact between players. E.g. lacrosse, tennis, baseball, football, and basketball. Very high-risk sports that involve extensive body contact and players often aren’t allowed to use protective eyewear, increasing maximum exposure to possible eye injuries in sports like wrestling, MMA, boxing, etc. Abrasions: Medically referred to as a corneal abrasion, this is the least serious form of sports-related eye injury. It usually occurs when something sharp (e.g. fingernail or fencing sword) scrapes the outer surface of the eye, which is usually quite painful. Eye Trauma: This is the most common injury type and occurs when something (fist, ball, knee, etc.) hits the eye with significant force. Eye trauma can cause mild (e.g. bruise) or severe (e.g. retinal bleeding) damage, depending on size, hardness, and velocity of the object hitting the eye. Penetrating Injuries: These are the most serious eye injuries, almost always resulting in sight-threatening damage. They occur when foreign objects (e.g. BB pellets, pieces of eyeglasses) hit and pierce the eye. Radiation Injuries: Caused by over-exposure to UV rays, these are quite rare and only occur with snow- and water-related activities. Orbital Fracture:: Usually caused by a blunt force that breaks the bone surrounding the eyeball, the orbital fracture can also include optic nerve damage and facial trauma. Depending on the severity of eye injuries in sports, certain cases can also result in permanent blindness. Any type of vision impairment will not only keep you out of the game for months but also affect your day-to-day life. This is why the importance of protective eyewear cannot be understated. Eye protection gear is easily available for all mainstream games including football, cricket, basketball, racquetball, lacrosse, skiing, golf as well as water polo. Safety glasses not only ensure eye protection against foreign matter and flying balls but also keep the risk of impaired eye vision at bay. Wear protective eyewear with cushioning along the eyebrows and polycarbonate lenses (that are powerful enough to protect against a .22 caliber bullet). Being extra careful when engaging in sports that involve sharp or flying objects. Wearing helmets and other face shields when appropriate. Get professional helps when picking your eye protection gear to ensure you are wearing relevant eye guards or goggles that shield your eyes against harmful UV rays. Only an ophthalmologist can accurately predict how long an injured eye will take to fully heal, after conducting a thorough eye checkup. This is why it’s crucial to visit an eye doctor immediately after sustaining a sports-triggered eye injury. Visually impaired athletes are at a great disadvantage. Their vision is less than a 100%, but corrective visual aids don’t help. Contact lenses get easily irritated by dirt or sweat, while eyeglasses can shatter while playing, and possibly even pierce the eyes. The best solution is LASIK (Laser Assisted In Situ Keratomileusis) surgery. This special form of laser operation corrects a number of eye problems. With successful LASIK surgery and full recovery (usually at least 2 weeks), a visually impaired athlete will be able to play without wearing contact lenses or glasses. Tiger Woods, Greg Maddux, and LeBron James are some famous athletes who have enjoyed the benefits of LASIK. Other than wearing a faceguard or protective eyewear that will bear the brunt of any impact during a game, visiting an eye care center for LASIK surgery could be your smartest move. At Insight Vision Center, we have an experienced eye care team that specializes in eye injury treatment and can efficiently address all your vision related issues. So, if you are ever faced with an eye injury, book an emergency appointment with us and keep your vision intact. When to Use Eyeglasses for Infants and Children? Your kid has made a successful visit to an eye doctor without causing any problem and has come out with a prescription for glasses. But the challenging part may begin now if he/she refuses to wear the glasses. The following suggestions will help you get the kids acclimatized with their new glasses. The frame should not pinch the ears or nose of your child. A well-fitting frame sits comfortably without leaving any pressure marks on the nose-bridge or ears. Check regularly if there is any skin irritation – change the frame if any signs of irritation show up. Most frames for infants and young kids are made of rubber-like materials for comfort. They also have bands that wrap around the head which prevents constant falling of the glasses, and also makes it difficult for kids to remove them frequently. If you child complaints that he/she can’t see clearly even with glasses or if they constantly look over the glasses, then chances are that the prescription is incorrect. Visit an eye doctor to get the accuracy of prescription rectified. Young children may find glasses very obtrusive when they first start using them and may start coming up with excuses not to use them. Don’t force it upon them – rather tell them to start wearing it for a few hours every day. Gradually increase their wearing time to full day. This gradual transition will allow them to get accustomed to glasses and, before they know it, they will be start wearing it regularly. Developing a routine around the glasses will be beneficial for the children. Encourage them to put on the glasses after waking up and take them off only while sleeping or bathing. It might take some time but once they get into a daily routine, it’ll come easily and naturally for them to use glasses on a daily basis. Letting the kids know that they look good in glasses will encourage them to wear the glasses. Treat them with a present for wearing the new glasses. Praise them every day, till they get comfortable, as positive reinforcements go a long way in convincing them to wear glasses regularly. It’s normal for a child to resist wearing glasses when they are new for them. However, don’t let their resistance and annoyance make you lenient. Ensure that the prescription is correct and then gently explain why it’s important for them to wear glasses regularly. Positive reinforcement usually works. Be persistent and eventually the kids will start wearing them regularly. Children are prone to dozen of eye injuries on the sports fields and courts when they play without protecting their eyes. Protective eye-gear come in prescription and non-prescription lenses. If your kid participates in any of the following sport, make sport goggles a must in their sporting kit. Children may hesitate to wear protective lenses if they are the only ones using the glasses in their team. Convince them to put on their glasses nevertheless. Allowing kids to choose their own eyewear will persuade them to wear the glasses. If your child can’t see distant or nearby objects clearly, make a visit to an eye doctor or an optician to get their vision checked. Once prescribed, make sure they diligently use the eye glasses to prevent further damage to the vision. August is the global Children’s Eye Health and Safety Month – a perfect reminder for you to have your children’s eyes checked. Give your children the best opportunities to develop the best possible vision they can, which is why regular vision checks are of absolute importance. All children’s eyes are mostly healthy, but you should have them examined during scheduled pediatric visits which should ideally start from the age of three onwards. We should all utilize this month to teach our children about the importance of eye safety and also implement it with immediate effect. Making it mandatory for your kids to wear protective eyewear while taking part in any sports or recreational events. Allowing them to play with toys that have no sharp or protruding edges or corners. Now that you have done everything that you possibly can to ensure that your child’s eyes are safe. Whether they are budding sportsmen or simply just playing with their friends, there are a lot of injuries that they are exposed to. According to current stats, roughly more than 12 million children suffer from some kind of vision impairment and eye injuries which are often the cause of eye injuries, of which 42,000 sports-related eye injuries. Take precautions and protect your children’s vision. This August, give the apple of your eye the gift of clear vision. Be a Super Mom and bring your child to InSight Vision Center for a comprehensive eye checkup. One of the most common tricks that parents use to encourage or trick their kids to eat vegetables is to amplify the ‘good’ a particular vegetable can provide. The common ones include eating spinach for strength, broccoli to make you smarter, drinking milk will make you taller etc. But one of the oldest and the most popular saying remains – ‘Eat carrots to get excellent eyesight’. Tricking younger kids may be simpler but there may come a time when they will start questioning the authenticity of such claims. Let us delve into the history to see of how this adage came into existence and became one of the most used statements by parents across the world. Bugs bunny’s favorite food became associated with strong eyesight during World War II when the British Royal Air Force managed to gun down German aircrafts even at nights. The air force fabricated a story of how their skilled fighter pilot John “Cats’ eyes” Cunningham attributed his excellent night vision due to a carrot-enriched diet. Soon, everyone began to eat more carrots get stronger night vision so that they could work in the dark as well. However, it turned out to be mere propaganda as the Air Force was, in fact, utilizing radar to locate the German bombers. It is extremely essential for healthy eyes. Carrots are rich in beta-carotene, a carotenoid pigment which is an essential precursor for vitamin A. If you don’t get enough Vitamin A, you risk getting cataracts, macular degeneration and xerophthalmia (A disease characterized by dry eyes, corneal ulcers and swollen eye lids). Deficiency in vitamin A also leads to blindness. This is an important antioxidant which is present in carrots. Food products that are rich in lutein are known to increase the pigment density in the macula. When the pigment density increases, the retina is protected more, thus reducing the risk for macular degeneration. Even though carrots are rich in nutrients, binging on them won’t improve your eyesight significantly. Once there is enough beta-carotene in your body, it will no longer convert to vitamin A. In fact, it’ll regulate the excess vitamin A to prevent accumulation of toxic levels of the substance in the body. Though there is no ‘ideal number’ of carrots one should consume, it can safely be said that having a moderate amount in your daily diet will be helpful. Most eye and vision problems are either genetic, due to aging, disease or an accident. Just eating carrots and infusing beta-carotene and lutein will not help in such situation. The right medication and eye treatment are essential. We can safely say that eating carrots every day will not sharpen your eyesight beyond a certain measure and will definitely not restore the vision to 20/20, nor can it correct certain optical deformities such as astigmatism, diseases like glaucoma and conditions like strabismus. If you have weak eyesight, using prescribed glasses or contact lenses is recommended. That definitely doesn’t mean that carrots don’t make a healthy snack – eat it to satiate those hunger pangs between meals and pack it in the lunches for your kids. But don’t let them believe that they can ditch their glasses just because they will get superman-like vision just by eating carrots. When you parents and grandparents told you to eat carrots for good vision, they weren’t entirely wrong. But if you are facing vision problems, visit a doctor instead of just relying on a carrot-rich diet. Laser Skin Resurfacing, also known as a laser peel, laser vaporization and lasabrasion is a technique to use laser beams to reduce facial wrinkles, scars and blemishes. With laser technology, surgeons have a higher level of control and precision around the delicate areas, thus offering better results. It’s a popular cosmetic procedure that helps in rejuvenating the skin through laser technology. Along with facial scars, wrinkles and blemishes, it reduces the effects of aging, sun and some facial disorders. It removes the outer, damaged skin and gives way to a smoother, younger, healthier-looking skin. The surgeon uses laser to send short, concentrated pulsating beams of light at irregular skin. The laser beam removes the epidermis (the outer layer of the skin), and simultaneously heats the underlying skin, which is called the dermis. This stimulates the growth of new collagen fibers. After the treated area heals completely, firm and smoother skin is formed. The ideal candidate for this procedure is someone with an elastic, non-oily skin that isn’t prone to scarring after minor injury. Patients with wrinkles, lines and uneven pigmentation can opt for laser skin resurfacing. Those with superficial facial scars such as acne or chickenpox scarring, birthmarks, enlarged oil glands etc. can also consider undergoing this procedure. It is crucial that the person is free of any medical conditions, including prescription medication and existing health conditions which may cause unnecessary risk during the treatment or recovery period. Before going in for the procedure, the candidate should have realistic expectations of the results. A local anesthesia is administered through an injection at the treatment site. If necessary, an oral sedative may also be used. Once the anesthesia is under effect, the surgeon will use a special laser to carry out the procedure. A controlled, pulsated beam of light is given which vaporizes the epidermis and reveals the younger-looking skin that lies underneath. The growth of new skin cells is also stimulated. The full procedure can take up to 2 hours while a partial procedure doesn’t last longer than 30 to 45 minutes. A concentrated laser beam minimizes the complications by restricting the amount of heat damage done to the skin. Diminishes the appearance of age spots, wrinkles, skin discoloration, birthmarks etc. Inform your doctor if you have any medical conditions, drug allergies or immune disorders before the procedure. This helps them in preparing better for the surgery and administering the right medication for your recovery without any threat of risks. The recovery period lasts around two weeks. During this time, the treated skin will heal and a new layer of skin will appear. However, the redness of the skin might persist for several months. Depending on the extent of the treatment, patients should take a break of one to two weeks from work immediately after the procedure. If you are considering getting a laser skin resurfacing, make an appointment with us today for a consultation. Eagles are beautiful birds known for their majestic frame and incredible hunting abilities. They have the reputation of having one of the best visions on the planet. What makes ‘eagle eyes’ a thing of envy? Let’s find out. Visual acuity is the eye’s ability to separate details of an object without any blur. The normal or a ‘good’ vision for a human is 20/20. Eagles, however, have retinas with cones and have a much deeper fovea—a cone-rich structure in the back of the eye. These give them a visual acuity of an impressive 20/5, or 20/4 which allows them to hunt even the tiny prey from hundreds of feet up in the air. 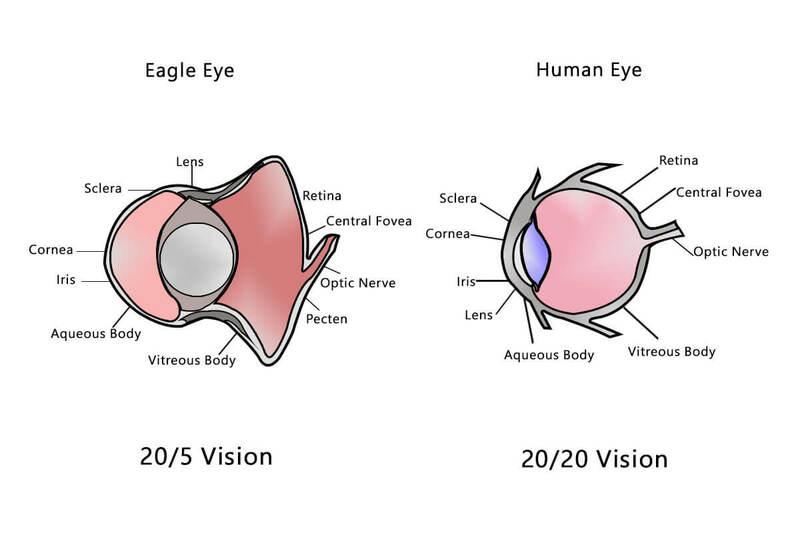 There is a scientific set-up to determine the strength of eagle’s vision. The birds are trained to fly down a long tunnel where two TV screens are kept at the end. One screen has a display of striped pattern to attract the eagle towards it and when they land on that screen, they are given a treat. The birds’ acuity is tested by changing the width of the stripes and determining from what distance the eagles begin to turn in the correct direction. Eagles have the ability to see colors more vividly than humans can. They can even see ultraviolet light and pick out more shades of one color. Their ability to even see the UV light allows them to see the bodily traces left by their prey. Mice’s and other small prey’s urine is visible to the eagles in the ultraviolent range, making them easy targets even a few hundred feet above the ground. Human eyes are positioned at the front of the heads, giving us a binocular vision and a peripheral vision of just 180 degrees. We can only see complete images when we use both eyes, as closing one will block a portion of vision that was visible with that eye. The use of both eyes gives us that ability to determine the depth of field and help us realize the speed of any moving object. Unfortunately, our peripheral vision is quite poor. On the other hand, an eagle’s eyes are rotated towards the front of the head and are angled 30 degrees from the midline of the face. This allows them to have a 340 degree field of vision. Their peripheral vision is quite impressive, which greatly assists these predatory birds. The ability to switch between seeing things that are near and far clearly require quick changes in the lens of the eyes, which is known as accommodation. As humans age, the muscles required to change the shape of the lens get stiff and become less effective, requiring us to wear glasses to see distant and nearby things equally clear. However, the eagles not only have a lens that changes the shape to accommodate the changing distance but even their cornea has the ability to change shape to better focus on near and far objects. It is obvious to want vision like an eagle but the characteristics and dimensions of human eye’s lens, cornea, iris, retina etc. limits our visual acuity. The best vision we can achieve is 20/10 or even 20/8. LASIK can help you in getting 20/20 vision even if you have poor vision, but achieving the visual acuity of an eagle is next to impossible. While attaining eagle eyes will remain a fantasy for us, you can improve your eye sight through LASIK. Visit InSight Vision Center and make an appointment today to explore your options. How Can Nutrition Help With Age-Related Macular Degeneration? Age-Related Macular Disease or AMD is an acquired ocular disorder that occurs in people over sixty years of age. It is the leading cause of vision loss in the US. This eye disease affects the central part of retina known as the macula and destroys it through retinal detachment. Macula is responsible for providing sharp and clear central vision that is required for reading, writing and other visually demanding activities such as driving, stitching etc. The risk of AMD increases with age. The severity and nature of AMD differs from one person to the other. Many experience some or full degree of loss of central vision in one or both the eyes. As AMD progresses, it diminishes the ability of the individual to read, write, walk or drive safely, even recognize faces and perform everyday tasks. Around 90% of AMD patients have a non-exudative or dry form of the disease that results in the development of dry, atrophic scars in the macular area. These patients experience slower, more gradual loss of vision. The other 10% develop an exudative or wet form – this results in the leaking of fluid beneath the retina, with a greater and more rapid loss of central vision. Apart from aging, other risk factors include family history, poor diet, cardiovascular disease, obesity, lack of physical exercise, smoking, and high blood pressure. There are studies that prove that diet, not just supplements, can greatly help in preventing AMD. Diets with above-median levels of beta-carotene, which includes lutein and zeaxanthin, vitamins C and E, and zinc have been associated with a 35% reduced risk for the disease. Additionally, food sources that are rich in omega-3 fatty acids are also highly effective. Incorporating plenty of green leafy vegetables along with fish is highly recommended to prevent AMD. Veggies and fruits with carotenoids (beta-carotene, lutein, zeaxanthin) and vitamin C: Broccoli, peaches, kale, apricots, pumpkin, carrots, mangoes, bell peppers, tangerines, cantaloupe, avocado, spinach, grapefruit, blueberries, green peas, honeydew, collards. Though most dietary supplements cannot completely prevent AMD, they can definitely slow down its progression in those who are already suffering from the disease. High levels of vitamins C and E, beta-carotene, zinc and copper from supplements are known to reduce the risk of progression to advanced AMD by 25% after 5 years. The effect persisted for another 5 years of follow-up after the study. Follow a diet that provides carotenoids such as beta-carotene, lutein and zeaxanthin, vitamins C and E, zinc and omega-3 fatty acids. Not only will it boost your health but also help in preventing AMD. If you have a family history of AMD, consult with your doctors regarding the supplements you need. Make necessary lifestyle changes – quit smoking, exercise regularly, keep your blood pressure and cholesterol levels at acceptable levels. If anyone over the age 60 in your family is suffering from vision problems, get it checked immediately at InSight Vision Center. Make sure they follow the right diet and ea nutritious food to prevent AMD or reduce the speed of its progression. Retinal detachment occurs when the retina moves from the underlying supportive tissue causing blurred or loss of vision. This condition may occur following the presence of a tear within the retina. As a result, an accumulation of fluid in the retina builds up scar tissue in the eye. Therefore, this is considered a medical emergency; hence, treatment must be undertaken as soon as a diagnosis is made. In most cases, a retinal detachment surgery is recommended to repair the tears, prevent further complications as well as restore proper vision. Surgery may be conducted under local or general anesthesia. This is preceded by administration of eye drops that widen the pupil. This is perhaps the most popular of the four retinal detachment surgeries. This procedure involves the attachment of small bands of plastic or silicone to the sclera (outside of the eye). The band buckles (compresses) the eye inward thereby minimizing traction (the pulling) of the retina eventually allowing it to reattach itself to the inner wall of the eye. The scleral buckle attaches on the posterior quota of the eye but remains invisible long after the surgery is complete. In some instances, scleral buckling surgery may be combined with other surgical procedures in order to fuse the retina with the retinal pigment epithelium (underlying supporting tissue). This retinal detachment surgical procedure involves the removal of the clear jelly-like fluid from vitreous body, which is the posterior chamber of the eye. This is then replaced with clear silicone oil that pushes the detached part of the retina into place. This surgical procedure entails the injection of a small gas bubble in the vitreous body (the gel-like substance between the retina and the lens). This bubble causes the vitreous to rise and press against the retina effectively closing the tear. A freezing probe or laser may then be used to seal tears on the retina. The use of the freezing probe is referred to as cyropexy while the procedure of using a laser is also known as photocoagulation. Here, a laser beam is directed at the tear on the retina. This beam burns the area around the tear to create scarring on the retina’s underlying tissue. Furthermore, it is important to consult retinal specialists who have advanced training in surgical and medical treatment of retinal disorders. A combination of either of these retinal detachment corrective surgeries may be recommended depending on the extent of the detachment. It is also important to keep in mind that undergoing surgery does not guarantee the restoration of your vision. Ultimately, reattachment of the retina must be done at the earliest opportunity to prevent loss of vision and related complications. You can contact InSight Vision Center and schedule an appointment to get your eye checkup done. The retina is that part of the eye that not only serves as a light sensitive wallpaper but also sends visual messages to the brain. When a layer of the retina is either lifted or moves from its position inside the eye, the condition is known as retinal detachment. This condition is considered to be a medical emergency; therefore, it must be corrected and treated right away to prevent permanent loss of vision. The presence of a curtain/veil that causes the loss of the field of vision. This barrier may come from any direction. Flashes of light also known as photopsia – Retinal detachment patients experience sudden flashes of light that are uncomfortable. These flashes are very brief and are felt within the extreme peripheral part of vision. An increase in floaters – These are specks or cobweb like substances that float on the eye’s field of vision. The increase may be sudden or gradual depending on the severity of the retinal detachment. The presence of a ring of floaters on the skull (temporal) side of the central vision. The presence of a dense shadow in the outer vision that progresses to the central vision over time. Appearance of curves in otherwise straight lines. This is also referred to as a positive Amsler test. When you experience any of these symptoms especially floaters and the sudden flashes of light, consider consulting a doctor immediately. Retinal detachment can be alleviated when warning signs are detected early and treatment is sought. This means, there is a great need to ensure that many people are educated about the signs so that they may seek treatment if by chance they experience any of the symptoms discussed above. There are several risk factors associated with retinal detachment. Some of these include cataract surgery, retinal tears, myopia, family history, trauma and complications relating to cataract surgery. Trauma: This is particularly common among those who are engaged in high speed or high impact sports. Thus, is it recommended that such activities like skydiving or diving be avoided altogether. Myopia: People who have high levels of myopia are advised to stay clear of activities that have the potential of producing trauma, which thereby increases pressure in the eye. Such activities include bungee jumping, rapid deceleration or acceleration or roller coaster rides. Family history:Retinal detachment may also be a result of your genetic composition where certain factors promote the photo receptor degeneration or local inflammation of the retina resulting in this condition. Some diseases also predispose the eyes to the development of this condition. They include lattice degeneration of the retina, the use of certain eye drops and the presence of chronic inflammation of the eye, which is referred to as uveitis. In conclusion, retinal detachment is a serious medical condition that must be detected and treated early to avoid potential loss of vision. Get in touch with InSight Vision Center if you see any symptoms of low vision. Our eyes are integral to our body, allowing us to view the world around us. Imagine being able to touch, smell, hear and feel everything but not see, like a car with dead headlamps driving down a highway. The dark isolation of vision loss can be quite horrifying! This fantastic process happens when the optic nerve creates an image through the cornea and displays it on the retina (a light sensitive layer of tissue that acts like a screen). Retinal detachment, or RD, is a medical condition where the retina peels off from the surrounding tissue. Rhegmatogenous: The most common type, where the retina detaches from the Retina Pigment Epithelium (RPE) due to fluid getting under it after a retinal tear. Tractional: A rare but serious type, where the cracked retina rips from the RPE due to the contracting scar tissue on its surface. Exudative: This type occurs without holes, tears or breaks in the retina, and is caused by fluid leaking into the area under it (typically due to inflammation, injury or vascular abnormalities). Other diseases and medical conditions like diabetes, AIDS, sickle cell disease, etc. RD caused due to injury or underlying medical conditions can happen at practically any age, but is more likely to occur after the age of 40. Almost half of all the people who have retinal tears are likely to end up with a detached retina, which puts sportspersons and athletes at high risk. Men are more prone to it than women, and research shows that Caucasians are at higher risk than African Americans. A dark ‘curtain’ approaching the center of your vision from the side (peripheral vision). Fish-eye vision for linear objects like roads, trees, buildings, etc. popular one. Small bands of silicone or plastic are attached to the outside portion of the eye – the sclera. As a result of which the band compresses the eye inward which minimizes the traction of the retina, which eventually allows it to reattach itself to the inner wall of eye. The scleral buckle thus created attaches on the posterior quota of the eye but is invisible long after this surgery is completed. In some cases, the scleral buckling surgery may be performed in combination with other surgical procedures so as to fuse the retina with the retinal pigment epithelium, the underlying supportive tissue. of a laser beam is known as photocoagulation. However, the rate of success of this retinal detachment surgery is lower than the Scleral Buckling procedure. detached part of the retina into the correct position. tear to create scarring on the retina’s underlying tissue. In addition to the above procedures, Cryotherapy or laser photocoagulation may be used to prevent the detachment from spreading. To prevent RD, be pro-active and tackle the initial stage symptoms. Schedule a regular eye checkup every year and consult your eye doctor if you suspect a retinal tear or rip. Also, wear protective goggles for sports, driving, working with chemicals, machines or tools, etc. There are some famous personalities who suffered from retinal detachment, including the 26 th American President Theodore Roosevelt, renowned basketball player Amar'e Stoudemire, noted publisher, journalist and politician Joseph Pulitzer, soccer star Pele and various others. Vision loss caused by RD can be prevented or cured with early treatment, if the retinal tear is corrected before detachment occurs. RD is considered a medical emergency that can severely affect your eyesight or even lead to blindness if left untreated, so if you have the symptoms, get in touch with an experienced ophthalmologist or eye surgeon at the InSight Vision Center!